In 2018, Hazel will focus on ' Writing a Non Boring Family History' , ' Authorpreneurship;The Business of Creativity' and 'Not Just a Piece of Cake:Being an Author' & non-boring memoir writing for adults. From school author visitsto conference keynotes, how-to-write workshops to Antarctica talks, or webchats with remote or international schools, Hazel is a dynamic presenter who engages audiences on different levels and diverse topics. 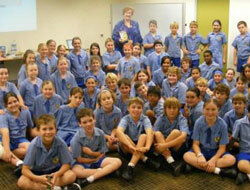 Book Hazel today for your school literacy festival, book week celebrations or library program. Hazel speaks at conferences, community groups, festivals and runs a series of workshops throughout the year. Hazel can also tailor a presentationto suit your organisational needs and offers a limited number of one hour book consultancy sessionseach year. Please Note, Hazel's speaking engagements are popular and bookings are secured months in advance. To ensure your date is available, please book as soon as possible. 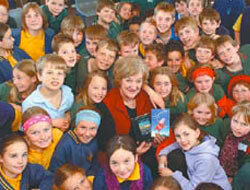 Hazel charges the Australian Society of Author rates. For upcoming workshops, click through to Hazel's Calendar of Events. These topics can be customised to suit the needs of your audience and event. Please click on the topic for a detailed overview of the presentation. Contact Hazel for more details on speaker topics, bookings and customising a presentation to suit your needs. Downloadable Hazel bio and hi res author photo for conference organisers under Media Resources.